Mark Gertler was born in a slum lodging house in Spitalfields in 1891, the fifth and youngest child of Austrian-Jewish immigrant parents ‘trying their luck’ in London. Repatriated to their native Przemysl in Galicia the following year, the family lived on the brink of starvation after the departure of Gertler’s father, Louis, to search for work in America until they were reunited in London’s East End in 1896, less than a mile from where Mark had been born. Following an unhappy apprenticeship at Clayton and Bell stained-glass makers, and a brief training at the Regent School Polytechnic, Gertler entered the Slade School of Fine Art (1908–11), aided by a loan from the Jewish Education Aid Society – the first and youngest Jewish working-class student of his generation to do so. His spectacular progress – he twice won the Slade scholarship and left with another from the British Institution – encouraged further ‘Whitechapel Boys’ including David Bomberg, Jacob Kramer and Isaac Rosenberg to follow in his footsteps. He had five solo shows at the Goupil Gallery (1921–6) and was a leading member of the London Group, but tuberculosis, first diagnosed in 1920, confined him to sanatoria in 1925, 1929 and 1936. Despite five further shows at the Leicester Galleries (1932–9), Gertler became an increasingly isolated figure in his last decade, commiting suicide in 1939. A still life of a blue vase containing sprays of chinese lanterns (cape gooseberries) and three green persimmon fruits at its base, shown against a blue-green stippled background. The work is known as ‘Winter Cherries’. 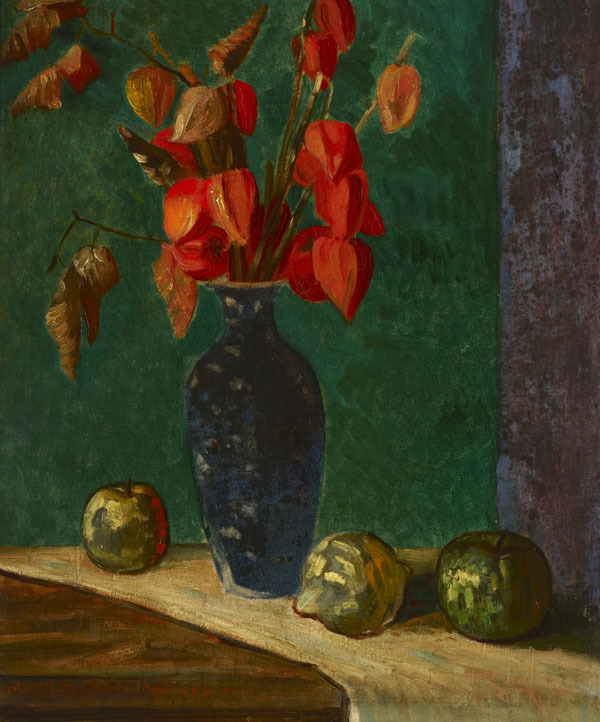 Gertler often reused props and still life arrangements and part of this arrangement reappears in his modernist portrait of his sister Sophie, 'Portrait of a Girl', dated February 1912, in the Tate collection.